High upon the rolling hills above the roiling sea, we stand. The world is passing by. The wind blowing in off the coast has brought rain clouds of blue and purple that release fine veils of rain. Our eye is led down and across the hills. The light shifts from dark chocolate browns to burnt oranges and gold. In the distance, muted blues and violets and finally a grey blue suggest misty land meets the sea. In turn, light touches the surface of the water, glittering like a burnished diamond. As with all of the ‘As Far as the Eye Can See’ paintings I’ve made, the horizon line shifts, moving backward and then forward, up and then down. It’s sometimes distinct but then disappears leaving us to guess what may or may not be. Is it a headland we can see or is it a shadow falling upon the sea? Whenever I make one of these vista pieces, the ephemeral quality of nature’s elements and shifting light, what is real and what is not is the driver. When I reach the final stages of the painting, the magical part is trying to push back further and further the horizon line without it finally disappearing altogether. That tipping point is the axis on which the painting revolves. This painting, John, is very moody, almost with the kind of clouds we are getting now, whether it’s rain, sleet or thundery it looks like what’s here in the UK now…..blustery as well the painting makes you feel you are in the weather! A friend of mine is in Galway at the moment and that part of Eire is getting some weather, some of the face book photos give you an idea, albeit by the sea….this picture is so colourful and as I say moody, in a good way! I will never win a prize for art reviews will I? That’s very much part of what I hoped for and our connection to the elements. Hello John, as I look at this painting I seem to be able to look further and further into its depths. I can only imagine the time, skill, imagination and talent that went into its making. 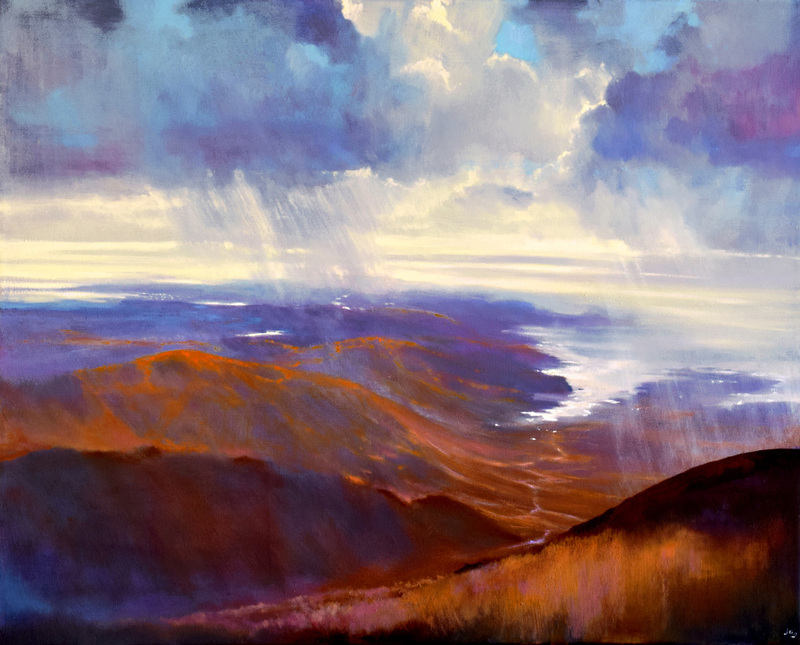 It features some of my favourite golds, orange and earthy tones in the hilltops and grasses and then the delicate blues and of the clouds, sky and rain as it falls. I really admire the way you have created the soft diaphanous light effects where the sea meets the sky – wonderfully executed. The overall impact is uplifting as nature lies before us in all its glory. Many congratulations, you must be very proud of it. Masterful use of color, John (love the unifying violets and blues in the land and sky), and gorgeous depiction of light and depth of field. The elusive horizon is a feat of magic, surely. Somehow for me the physical distance toward the vague meeting of land/sea and sky suggests the passage of time as well — the movement through life. The hot colors in the foreground and the brooding clouds suggest a turbulent energy that eases into calm as the eye approaches the softly lit forms, reflections, and shadows (or are these an illusion?) in the farthest reaches of the image. Just beautiful, John. Thank you for your insights on the painting. The ‘elusive horizon’ that you mention was very much an exercise in persistence, as I tried to push it back and failed, then reworked it time and time again. Perhaps the ‘feat of magic’ part Jo, was, not giving up on it. It’s an interesting point that you mention, ‘the vague meeting of land, sea and sky, suggest the passage of time, the movement through life’, that made me smile and reflect upon the painting again. Sign me up for the art updates!